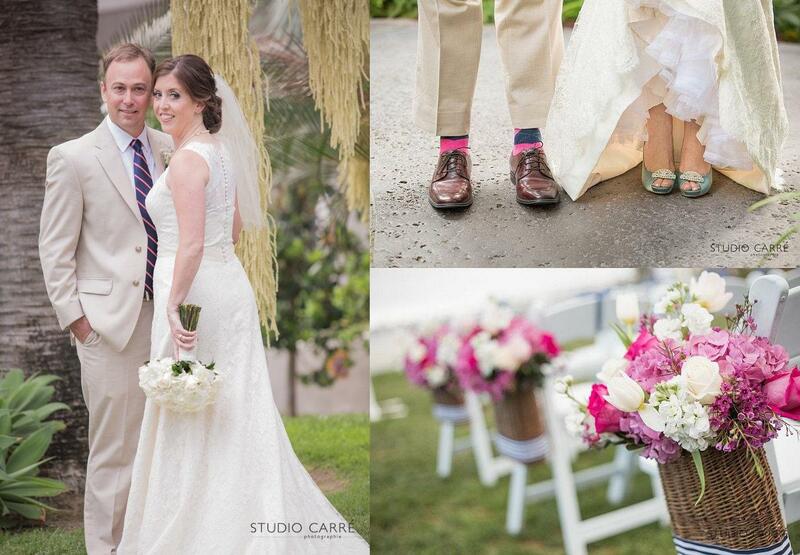 Sara and Brian planned a beautiful nautical-themed wedding at the Catamaran Resort and Spa in San Diego, CA. I actually knew the bride, Sara, when we were in grade school (La Jolla Bobby Socks!) so it was super fun to reconnect with her and make her wedding day amazing! The Catamaran Resort is situated on the San Diego Bay and therefore provided a perfect backdrop for their upscale beachy motif. Navy and white stripes, accented by bright pink tones, wove throughout the decor–from the invitations, to the linens, to the stripes on the men’s ties (and awesome argyle socks!). Sara’s attire of lace and pearls added a touch of formality to the affair. I think decorating in nautical is a great way to go “beachy” while still adding class. 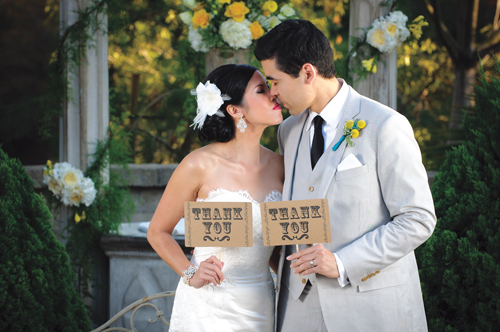 And this wedding was definitely all class! 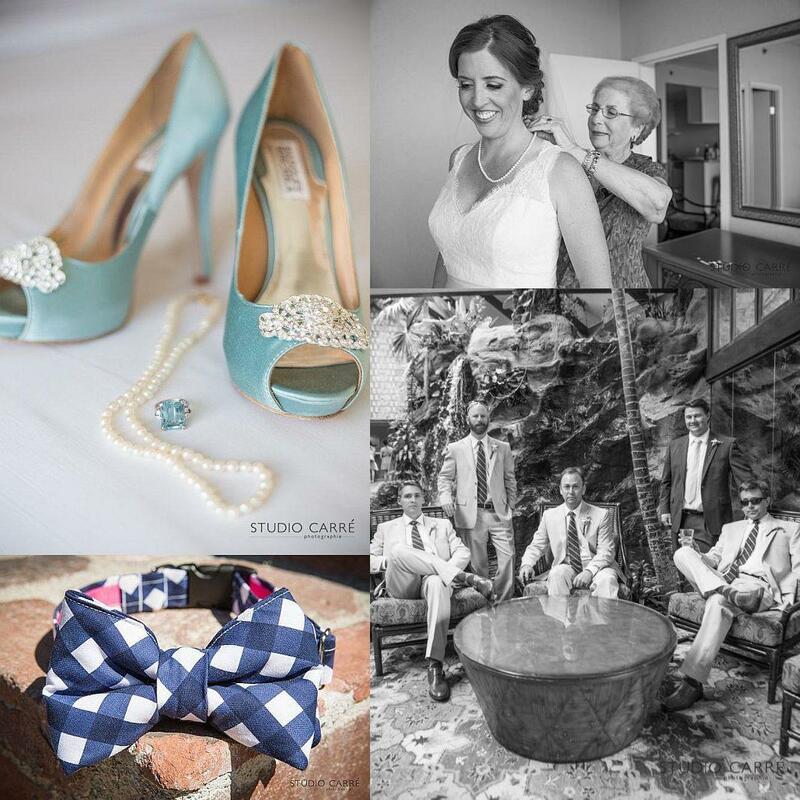 Above: Sara’s “something blue” in her shoes and earings, the cute and creative garter she wore, and the gentlemen getting ready for the big moment! Below: I adore the gentlemen’s attire! 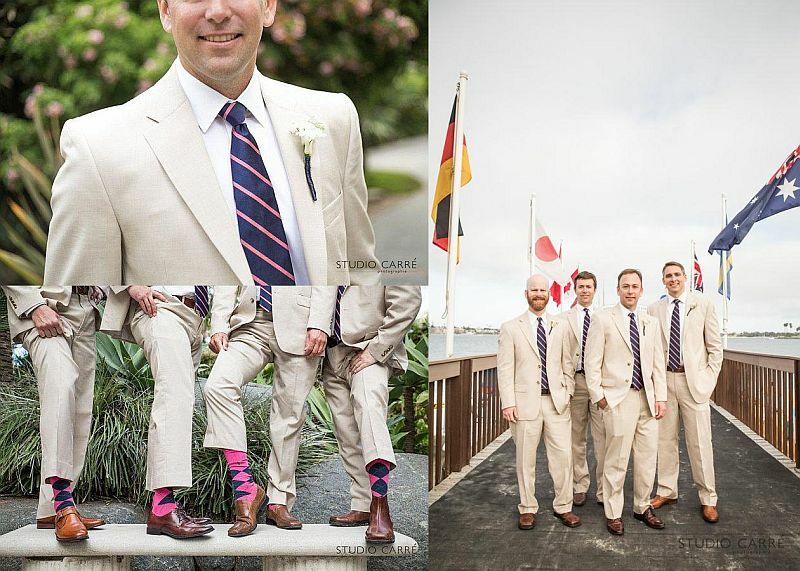 The tan linen suits are perfectly complimented by the bright navy and pink ties (and of course, the socks)! Below: the beautiful couple and the ceremony, facing the bay. Sara’s mom came up with the idea of the baskets to decorate the aisle. I LOVED it! My team then transferred them to the railing that framed the outdoor balcony adjacent to the ballroom. 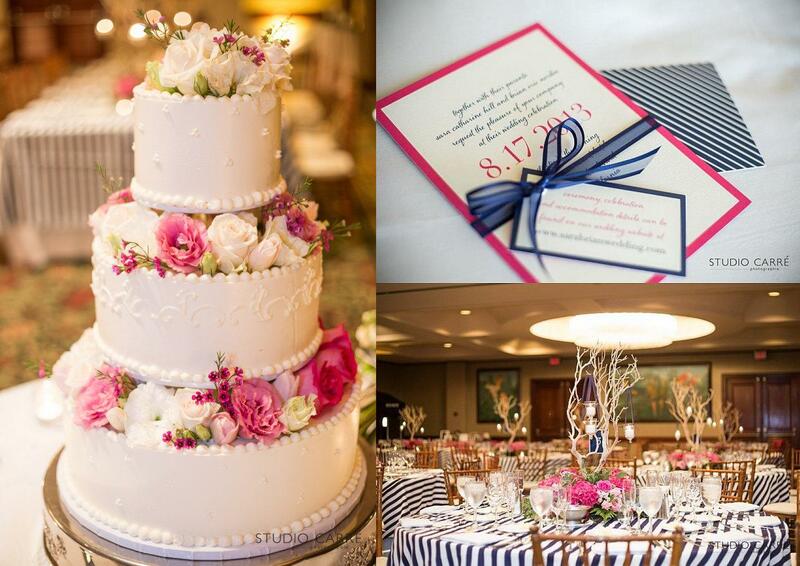 Below: our gorgeous cake, invitations, and nautical ballroom! Sara chose a light wood chivari chair to complement the beachy driftwood look of the centerpieces. My team hung candles and table numbers from the arms of the wood. The delicate pattern of the cake with the pink and ivory flowers was perfect! And the invitation wonderfully announced the theme well in advance. 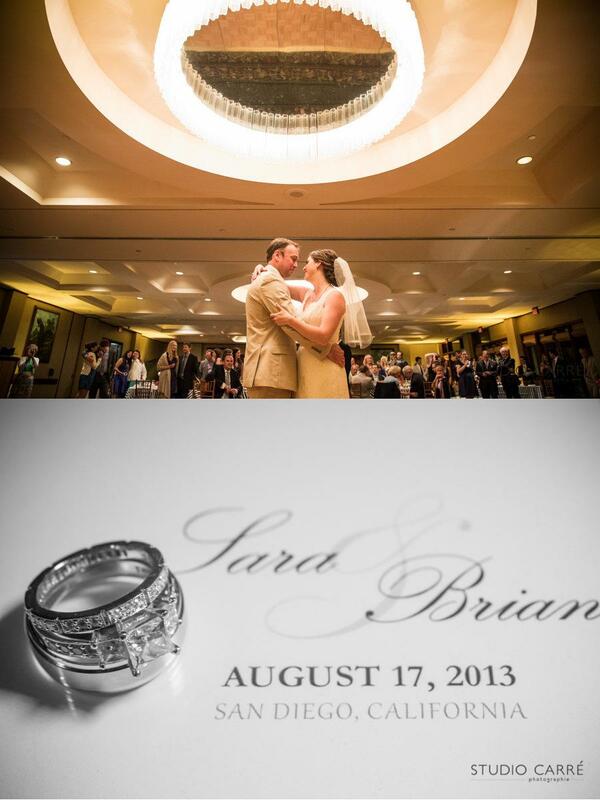 Below: Sara and Brian share their first dance. A perfect moment for a perfect couple! And special thanks to Shannon of Studio Carre for the amazing photos!